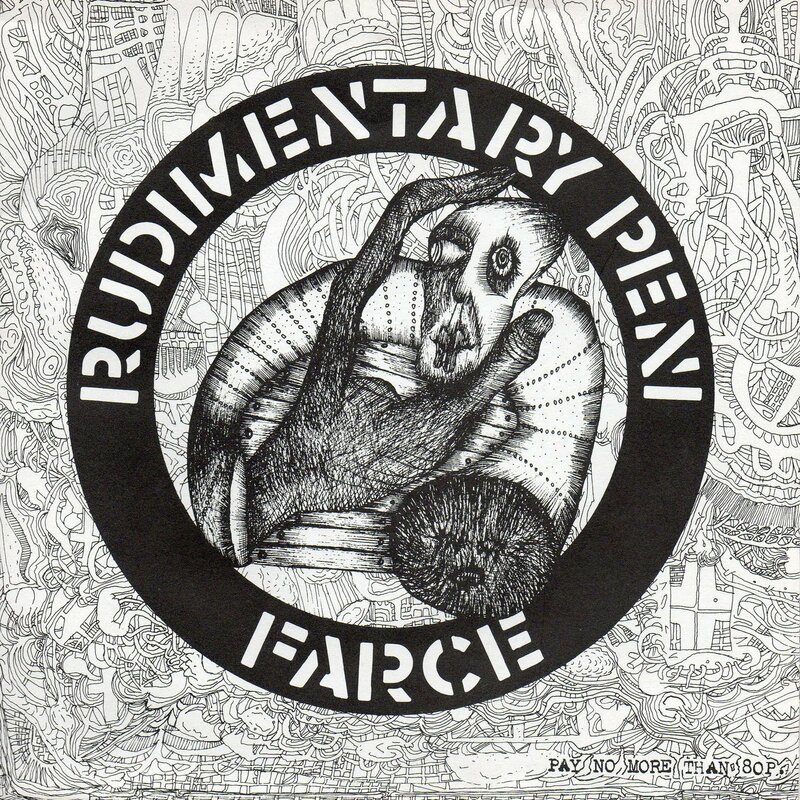 Thanks to the record covers he drew for Rudimentary Peni, the band for which he was vocalist and guitarist, artist Nick Blinko’s initial audience was mainly confined to the members of the thriving anarcho-punk scene of the early 1980s Britain. Despite apparently operating in the same aggressive idiom as their peers, however, it was immediately clear that the Peni were unique. The universe evoked by their music and lyrics, even at its most unpolished, was a delirious mixture of surreal landscapes, existential horror, bucolic whimsy, and manic excitement, all shot through with what sounded like the metastasized but beguiling echoes of childhood and a pervasive gallows humor. At once claustrophobic and expansive, Peni often engaged with the same political issues as their contemporaries, but did so in a way that made the overlap seem practically coincidental. 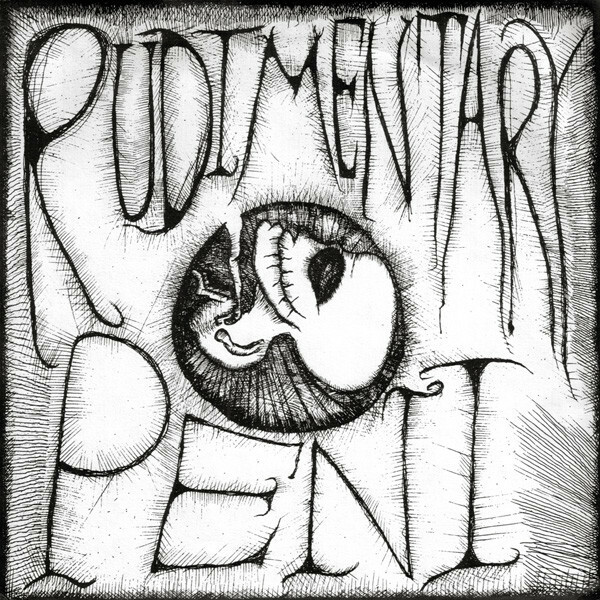 In short, Rudimentary Peni were some distance beyond just “meaning it.” Outsiders to many of the rituals of the punk scene, the band’s skepticism about the possibility of change bubbled under the surface of their output even in their most “optimistic” moments. The same was true of the artwork that Blinko made for them. 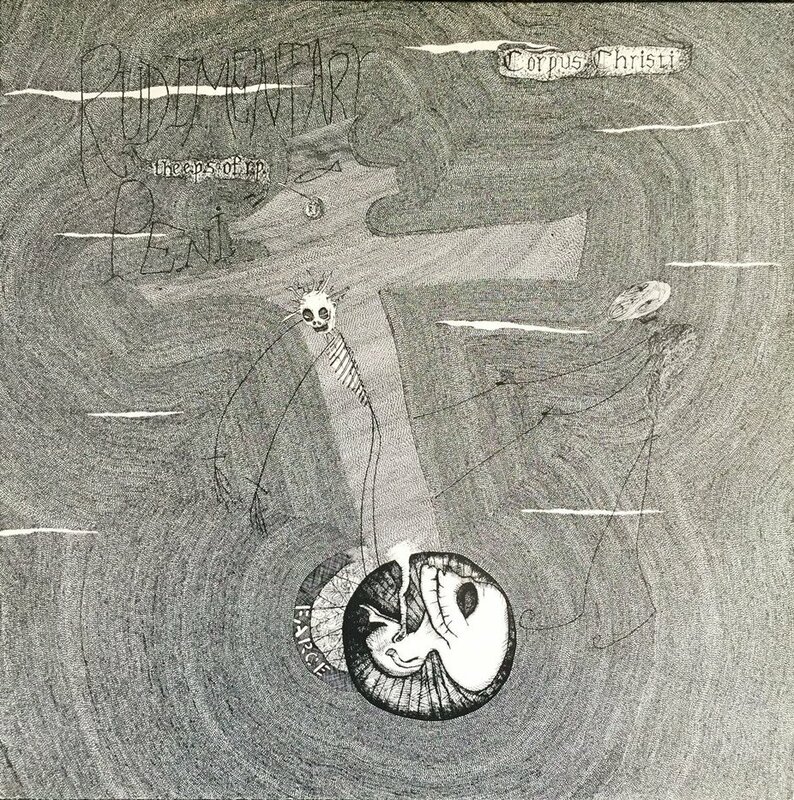 Though rudimentary (sorry) in comparison to the work that he would later produce, the cover of Peni’s first EP in 1981 was clearly already the product of a fully-formed aesthetic, the smirking undead fetus the manifesto of a bittersweet vision as playful as it is unremittingly gloomy. Despite the extent to which self-aware postmodern goth dross has since permeated popular culture, it is testament to the uniqueness of Blinko’s vision just how striking that early cover remains, its apparent artlessness concealing immense graphic nous. The cover of the band’s follow-up EP, Farce, released on Crass Records and accommodating that label’s artwork format, managed to be just as odd. The band’s music continued to evolve in unpredictable ways, as did Blinko’s art, revealing an increasingly intricate style that evoked something resembling a frenzied Virgil Finlay channeling Leonara Carrington. 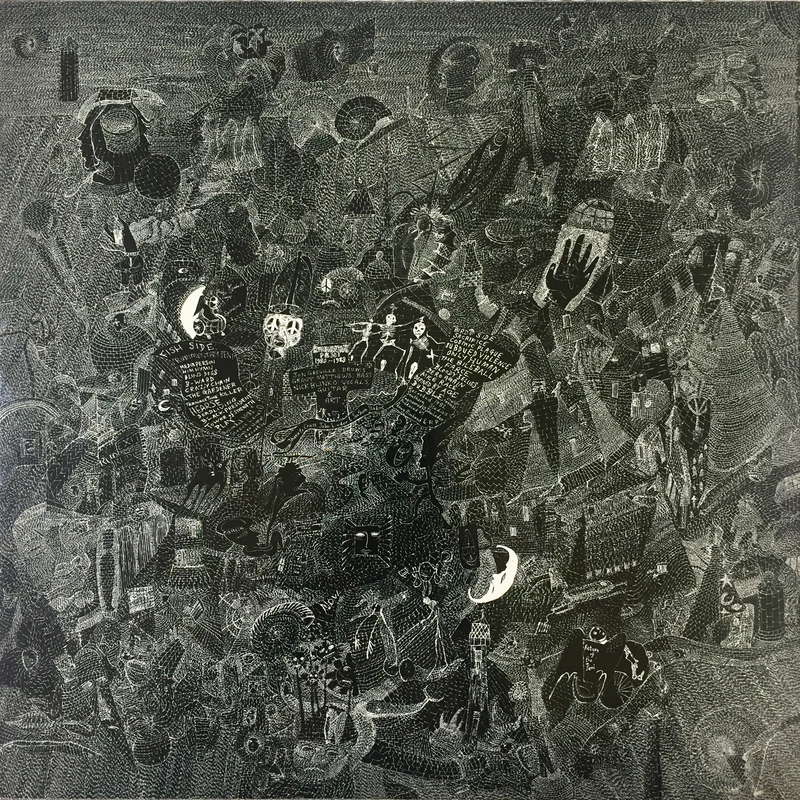 His work for the Peni reached its peak in the fold-out cover for the band’s first LP—1983’s Death Church, so densely shaded that it is as impossible to photograph as some cursed relic—and the impossibly detailed cover of the 1987 LP reissue of their first two EPs, The E.P.’s Of R.P. The band’s run of transcendent cover art ended with the following year’s Cacophony, a paradigm-shifting concept LP about obsession with H.P. Lovecraft that has been called, not inaccurately, the “Trout Mask Replica of British punk,” but whose cover proved surprisingly literal. Its later re-release with different artwork suggests that Blinko and the band may have felt the same way. The same motifs that fill Rudimentary Peni’s songs inform Blinko’s art: religion, history, alienation, place (especially the area around his birthplace of Abbots Langley near London), madness, fear, death, beauty, and the uncanny. And yet, rather than hopelessness, the world Blinko conjures up evokes confusion and awe at the mind-boggling detail and intimidating brevity of existence—and the vastness and mystery of the darkness that lurks around it. Despite having been co-opted by the world of fine art as an “outsider artist,” Blinko’s work remains as idiosyncratic as ever, and his sprawling visions of a world at once overpowering and incomprehensible and yet familiarly complex never seem to lose their obsessive power. Some time in the spring of 1988, armed with an address found under an illustration in an horror fanzine, I got Nick Blinko’s number from directory inquiries on a whim, something you could still do at the time, free of charge. A copy of the as-yet unreleased Cacophony had been inching its way through the capillary root system of the UK punk scene and, by the time it reached me, recursive tape-to-taping had given it the texture of warm alien fur. For no clear reason, I, neurotic and shy, dialed the Blinko residence. Intimidated by the accent of the voice that answered—the north and the south of the UK seemed like two entirely separate planets at the time—I dissembled, claiming to have called a wrong number, and promptly hung up.